Not the 70s group, or the colloquialism for money, I am talking the real thing – gluten goodness. In case you missed it (I did) there was a earth shaking moment in the baking world about 2 years ago (Nov 8, 2006). 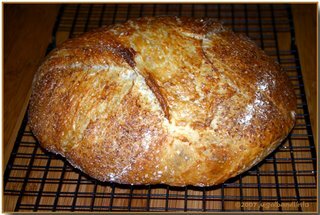 The NY Times published a “no kneed” bread recipe from a guy named Jim Lahey. This thing was bigger than bread before it was sliced. I was alerted to this fact a couple of weekends ago when I read in the Sunday paper about an improvement to this recipe. 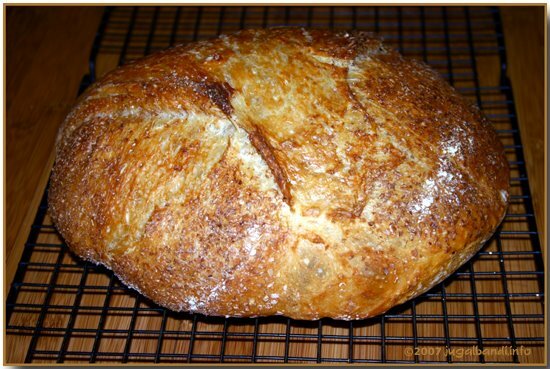 I was intrigued, I looked up the original and I was flabbergasted at the number of hits you get when you google “no kneed bread” go ahead – try it. Sooo, I had to bake it, and I did. It was the best I ever made. It was very simple, it just took time and a dutch oven with a lid (I used my Le Crueset). I highly recommend you give it a try. Sorry, we had to eat it all. What we couldn’t finish while it was fresh from the oven we ate as toast the next day. It didn’t last long. This one put la Madeleine’s to shame. Bon Apatite, a geology reference. You are wishing us “Good phosphate mineral”; it is #5 on Moh’s Scale of Hardness (talc gypsum calcite fluorite apatite orthoclase quartz topaz corundum diamond) and is what is mined (fluorapatite) in Central Florida for phosphate. And goes good with bread. Do you and Pam still have your Stratagraphic Column of Florida? I do. Tall girls can flirt and other queer things can do. Name that teacher. Shown up by the valedictorian and the salutatorian; Pam does, too. Ironically, I do not. And I am the one that is a Registered Professional Geologist in Florida. BYW, the map that we used to make the column was updated about 15 years back. Some of the stuff has been changed (not the rocks, the classifications). Like the Hawthorn has been upgraded to a Group, and includes several of the smaller formations like the Bone Valley, Arcadia, and Tampa Fms.